Down the street from our apartment in Seoul, we found a small eatery with a picture menu where we had a breakfast of Bibimbap in a hot stone bowl. Bibimbap is a Korean traditional food that is much beloved by many. It is comprised of rice which is topped with cooked and raw vegetables, hot sauce and your choice of protein. After consulting my online Korean dictionary a few dozen times, I finally was able to commit to my memory a few words. The Google Translation application suggested that I say: “As a favor to me, please omit the meat and the egg,” but the sentence had so many words in it, that I feared that the restaurant owner would gaze at me with vacant eyes, while wondering why am I asking for an egg of a fried Giraffe…. The sentence I did learn to say worked well, and the dishes that we got were delicious and fresh. Whenever I do say any word in Korean, people giggle with pleasure and laughter. 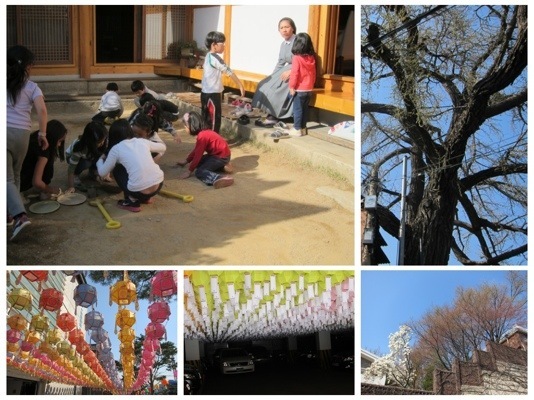 After breakfast we walked to see the Jongmyo shrine. 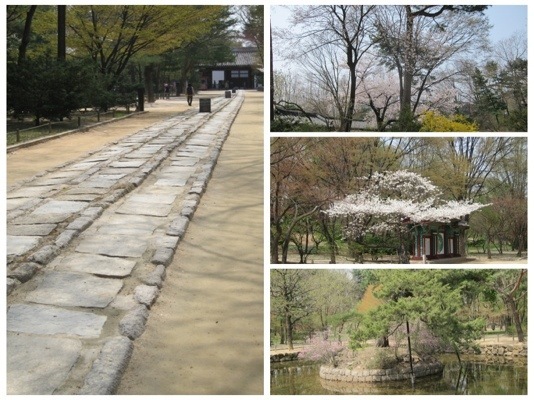 From the main gate there is a long stone path divided into three parts. The sides of the path were used only by royalty while the central part of the stone path is still kept for the ‘Spirits’ and no one was and still is, allowed to walk on it. 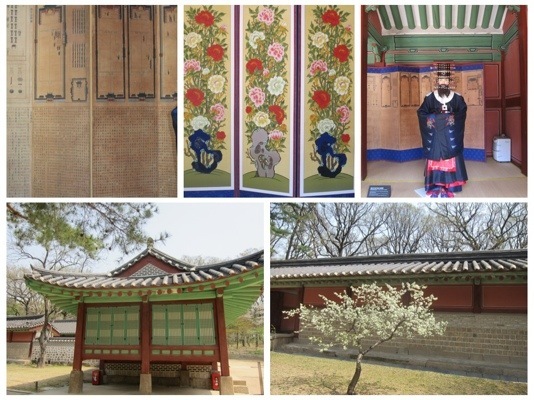 Before Buddhism was introduced to Korea, Confucianism was the main thought system in Korea, and it is still cherished today, alongside Buddhism and Christianity. 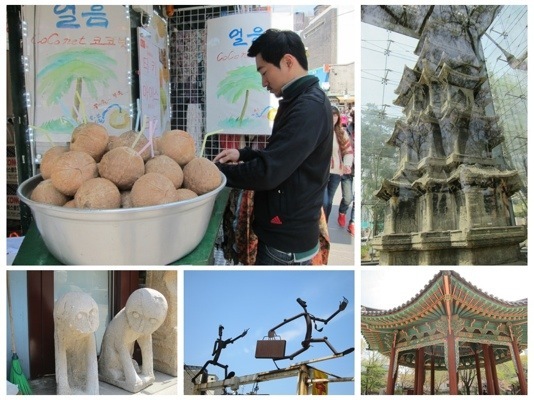 When Buddhism was introduced to Korea (around 300 AD), it spread very rapidly. 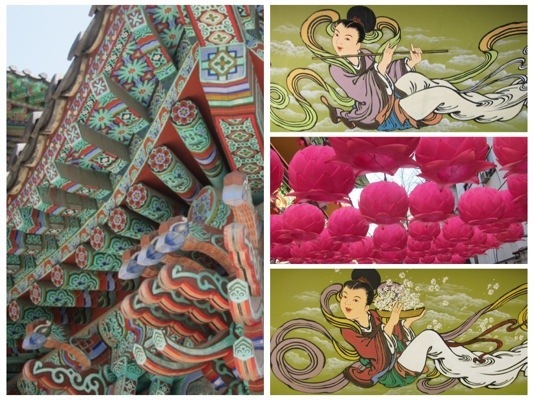 In Korea the most popular of the Buddhist branches, was the Zen Buddhism which is still practiced today. 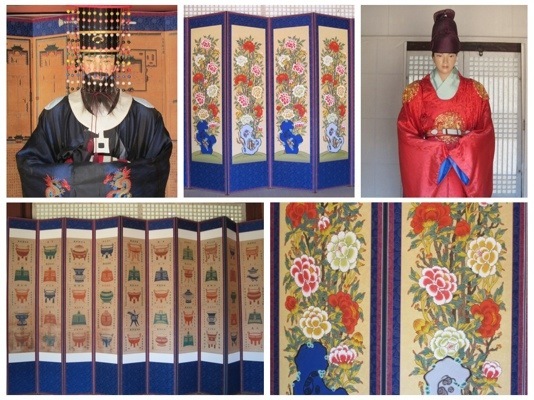 During the Joseon Dynasty (1398 – 1910), a new wave of Confucianism took place in Korea which was called Neo Confucianism. 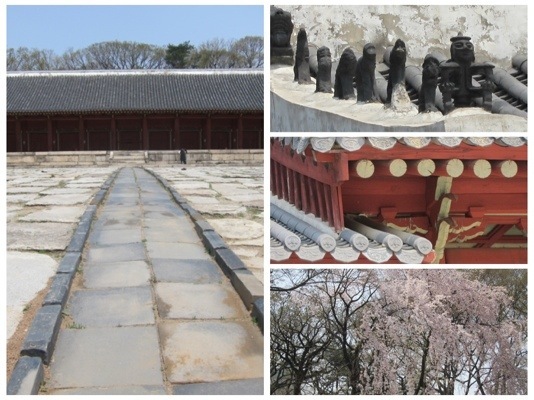 During the Joseon Dynasty, when this shrine was built, many of the Neo Confucian Koreans believed that when a person dies, the spirit was freed from its attachment to the body. The body was buried and placed in a tomb, while the spirit was freed to go to heaven. 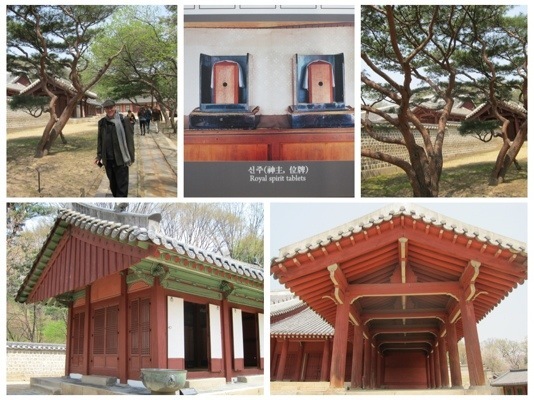 The Jongmyo shrine was built to honor, commemorate and to cherish the spirits of the departed kings and queens. Small Wooden tablets called “Spirit Tablets” with a central hole in them, were made for each immortal spirit. The hole in the wooden tablet was made so the spirit of the departed one can move through it. 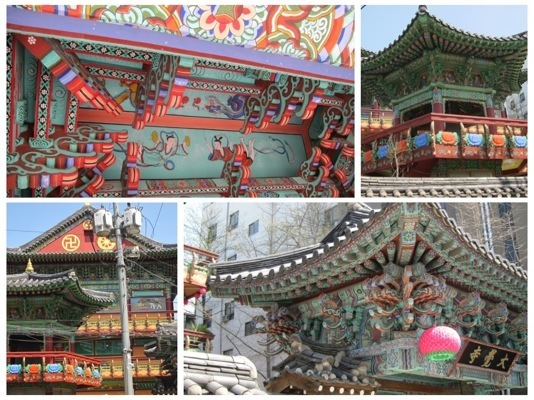 The Jongmyo shrine has 83 wooden tablets, one for each of the royal kings and queens that used to rule Korea since the year 1395. 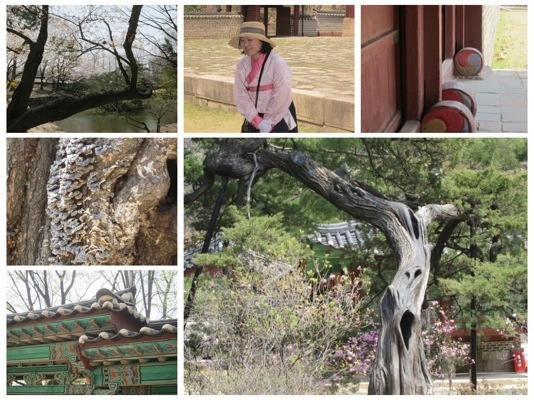 The shrine is set in a beautiful park with old gnarly trees and a serene feeling. 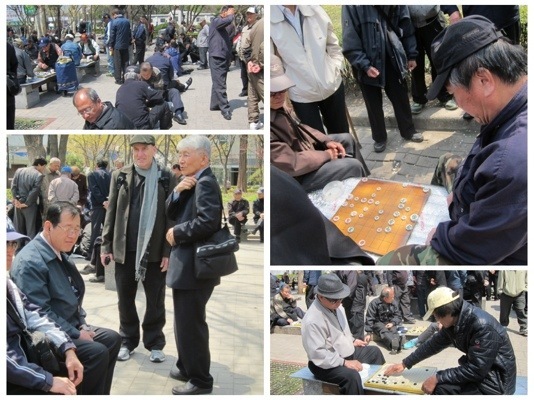 After visiting the shrine, we exited into a busy park which was filled with men playing board games. Each man brought with him from home a silver pad that looked a little like a windshield sun guard, but a little bit thicker, to cushion themselves as they sat for hours on the cold granite stones in the park. The most famous game was the “Go” game. It is played on a wooden checkered board with white and black rounded chips. A friendly man approached Jules and asked him where he was from and what was he doing in Korea. Before long, this pleasant gentleman, who was dressed in an immaculate business suit, engaged Jules in a long friendly conversation. The man spoke in a halted, yet beautiful English, and he explained that he was a government certified “Go” teacher. As Jules was conversing with this elegant man, I walked around photographing the men playground games. I noticed that some of them seemed to be retired army generals, with chests full of decorations and funny looking mustaches. There were ones who were obviously the comedians, some who seemed bitter and some of seem to be the kind souls who shared snacks made by their old kind wives. We were happy to accept his offer, after all, how often do we get an opportunity to learn from a “Go” Teacher who seemed so generous with his time and so willing to explain. It was obvious to me that this man was not trying to get paid for his lesson or his time. He looked like a well to do business man, with a kind heart who was happy to practice his English and to speak about the game that he loved. He told us that he was a business man in a telecommunication company, so he has little extra time, but he planned to become a practicing “Go” teacher, after his retirement. He told us that “Go” was invented in China about 2200 BC. He explained to us in details the strategy of the game and its principles. 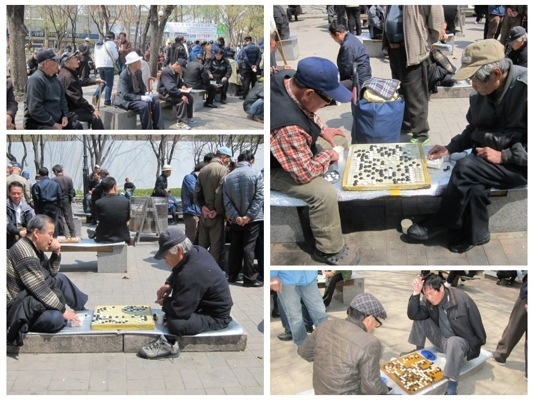 It felt good to understand a bit of this ancient game, which we’ve seen played in China and around Asia so feverishly. 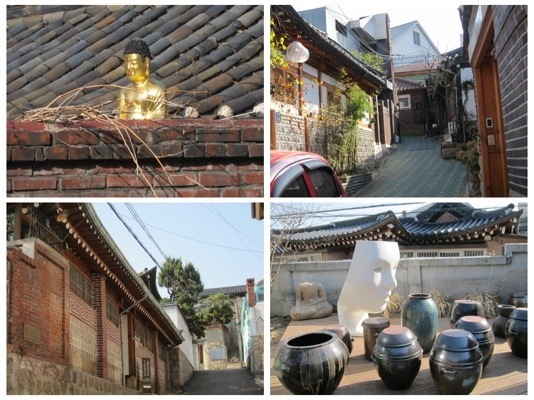 After the spontaneous “Go” Lesson, we walked to the restored Bukchon area and refreshed ourselves with teas and coffee at an art cafe. 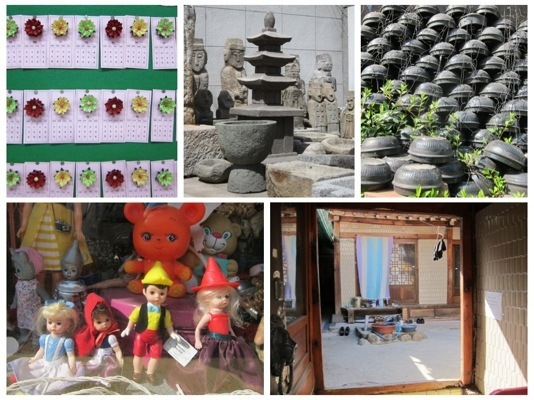 We walked around the old traditional Hanok houses, many of them converted into small museums, guest houses, tea houses and small shops. 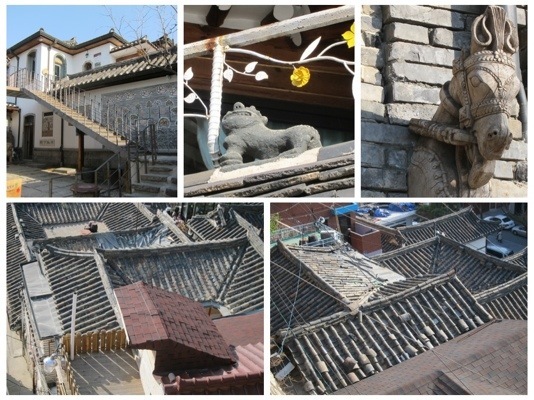 We walked up the hill which had views of the city and the old roofs of the Hanoks. 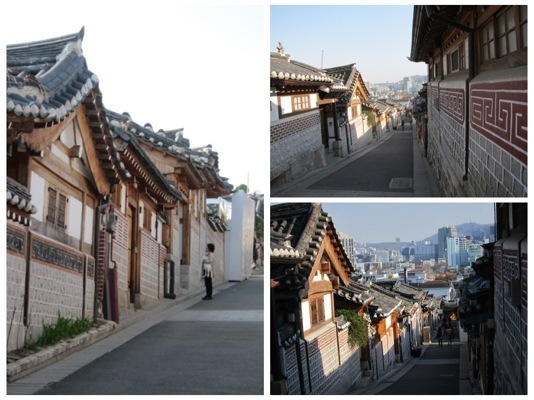 On our walk down, we entered the Samcheong-dong area which is located near the Gyeongbok Palace. It has become a hot spot for the stylish younger generation. 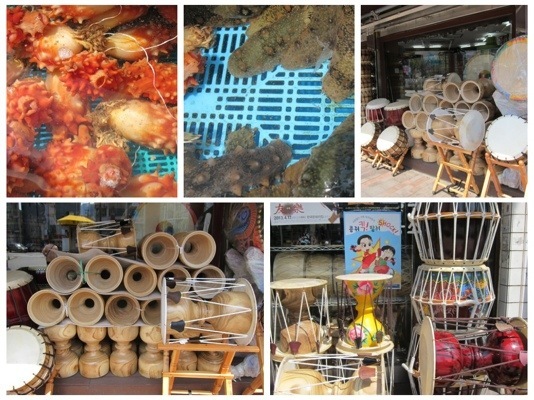 In recent years, the traditional neighborhood got a facelift as its Hanoks (Korean traditional house) were converted into chic, modern cafes, shops and pasta places. We were hungry and we looked for a place to eat which seemed to offer something good. We strolled into a popular eatery where we ate “Hangar Sujebi,” which is a Korean Korean-style Gnocchi that is served in a huge clay pot. The Sujebi is made from potato and rice flours. The eatery was actually a very busy ramen noodle place, with small tables with a central gas cooker in each. On the cookers, they placed a large clay skillet with ramen noodles, Sujebi, and vegetables and seafood, all bubbling in a tomato and spices broth. The place was buzzing with energy and it had a “wet” kitchen, with a lot of woman wearing red aprons and rubber gumboots, splashing in the kitchen as they served hundreds of customers. When we exited the eatery, the line of people waiting to get in, snaked around the alley. It was obviously a very popular place. 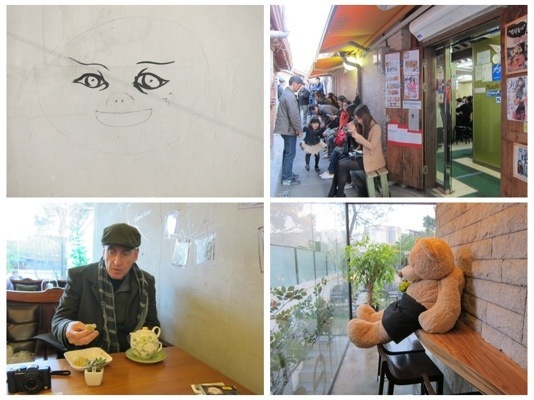 For desserts, we walked the charming streets of Samcheong-dong and found an elegant coffee house called “Out Of Africa” where we had some rose and jasmine teas. It was a good and interesting day. When I reflected about it, I thought that Confucianism had never appealed to me. It favors honoring tradition and familial relationships above all. Even though I can see the value in honoring our history, our traditions, and our cultural heritage, there is much need for new ways of thinking that can lead one closer to the Truth, and enlighten and enliven the human mind. In my humble opinion, we must not only love those who are related to us by blood, but love everyone as if he and she were our true brothers and sisters in Spirit. I always enjoy your writings and photography. Best to you and Jules! Jules also sends you his warm regards, and hope that you are doing and feeling well. We woke up this morning to a sunny day. The weather here in Seoul has been very changeable this spring. We had some warm sunny days along with rainy cold days. We are ready for a great day! Wishing you well as well!